We’d love your help. Let us know what’s wrong with this preview of Broom with a View by Gayla Twist. The threat of war between Witches and Vampires means England may no longer be safe for a young Witch. Hence, Miss Violet Popplewell is sent abroad under the watchful eye of her great-aunt Vera. Without so much as a bon voyage party, Violet finds herself a visitor to the Can a good Witch and a brooding Vampire find true love? Especially when the whole world is against them? To ask other readers questions about Broom with a View, please sign up. Entertaining and light, but nothing that memorable. The biggest draw was seeing how the writers adapted A Room with a View. I feel the characters and their relationships relied on the reader knowing them from the original novel to make them feel like full characters. BROOM WITH A VIEW by Gayla Twist was a charming and cute young adult romance that had me engrossed until the very end. A well done piece, Twist’s novel had nothing that even hinted at “self-published” and the only thing that was disappointing was that it was too short. Review: In BROOM WITH A VIEW, Gayla Twist introduces us to an alternative historical past, in which Vampires, Witches and Humans live together very tumultuously. The main character is Miss Violet Popplewell and she is a witch. When BROOM WITH A VIEW by Gayla Twist was a charming and cute young adult romance that had me engrossed until the very end. A well done piece, Twist’s novel had nothing that even hinted at “self-published” and the only thing that was disappointing was that it was too short. Broom With a View was lots of fun. It is a an alternate history retelling of A Room With a View by E.M. Forster. It opens in an England where Crafters and Vampires have been at war for centuries. The time period is never distinctly specified, but I’d guess it’s most likely Edwardian, so turn of the 20th century. The British countryside is deemed unsafe for a young witch and so Miss Violet Popplewell, our primary protagonist, is sent to X, a fabulous city on the border of Western Europe where the Broom With a View was lots of fun. It is a an alternate history retelling of A Room With a View by E.M. Forster. It opens in an England where Crafters and Vampires have been at war for centuries. The time period is never distinctly specified, but I’d guess it’s most likely Edwardian, so turn of the 20th century. The British countryside is deemed unsafe for a young witch and so Miss Violet Popplewell, our primary protagonist, is sent to X, a fabulous city on the border of Western Europe where the Crafters are mainly focused, and Eastern Europe where the Vampires hold sway. X itself, is friendly to both, as Violet and her Aunt Vera find out when they arrive at the pensione to discover that ‘Witch Friendly’ does not mean Witch Exclusive. There are, in fact, vampires in residence. Two of them. Comte du Monde and his son, Sebastian. Hostilites soon break out in X, leading Violet, Vera, the Comte, Sebastian, and a motley crew from the pensione must seek refuge in the countryside. This leads to the sort of trouble that young women in romantic novels always get themselves into. Sebastian kisses her, they are discovered, and Vera flees with her back to the war-torn X where they encounter the most unlikely family of Mortals being accosted. Violet is, I’m happy to report, a much more active protagonist than Lucy Honeychurch. Lucy is very much a girl of her era, where as Violet is a Witch of her’s. This allows for a great deal more agency, which I appreciated. I will say, and this is most likely a result of recently going through a writer’s workshop, that the POV was occasionally disorienting. There are multiple 3rd person POVs and I sometimes had to take a moment to reorient myself when we changed character, but they were all well written and well characterized. I’ve just been reading and writing in fixed 3rd person for so long that it was almost revelatory to find myself getting Sebastian’s perspective. Witches and vampires are really nothing new. Twilight and Beautiful Creatures have both been and gone, and there have been countless TV series and books on those two subjects that the ideas begin to run dry, that is, until you put them both together and have them fight it out. For Twilight it was werewolves, but in Broom with a View, casters are the new enemy of the vampire, and any relationship between the two is vile and dangerous. That is why the book stands out; the premise isn't the same ol Witches and vampires are really nothing new. Twilight and Beautiful Creatures have both been and gone, and there have been countless TV series and books on those two subjects that the ideas begin to run dry, that is, until you put them both together and have them fight it out. For Twilight it was werewolves, but in Broom with a View, casters are the new enemy of the vampire, and any relationship between the two is vile and dangerous. That is why the book stands out; the premise isn't the same old thing; human falls in love with supernatural being even though it's dangerous for them. No, this is more complex than that; these two are natural enemies. The book is a third person narrative, focusing almost entirely on Violet, our leading witch. It is also a historical-type novel, presumably based in the Edwardian period, since that is when Room With a View takes place. However, it was very difficult to tell the period of the novel, and although the social etiquette added very nicely to the story, there was nothing relevant enough that it could not have been told in another time zone entirely. Maybe it is just me, but if you base something in a period of history and there is a war going on that includes England, would you not want to draw parallels with a war that England was involved with in our own history to make the story feel more real for the reader? This might be a tad pedantic of me, but I truly believe that this would have added more interest to the story. Not to say the story was not interesting in the slightest, because I couldn't stop thinking about it when I wasn't reading. I always wanted to know how the issues would be resolved, and eagerly awaited the times when I could pick it up again. The main reason was the mess Violet gets herself into with a mortal man, Mr Wilberforce, after she agrees to marry him despite her best efforts. As for the characters, Violet and her Aunt Vera were extremely well-drawn, along with Mr Wilberforce and his controlling mother. For such a quick book, many other characters also had more than one dimension, which was lovely to see. There was one exception; Sebastian Du Monde, who seemed quite one-sided throughout. There were no explanations to his moodiness at the beginning of the book which was quite compelling, nor any about how his motives at any point. I was contacted on behalf of the author to write an honest review of this book. Immediately the description made it sound like something I would definitely be interested in. It took a while for me to get through it, but that's simply because I am getting used to taking care of two kids. I think the story was pretty good. It was a little slow to get to the action and there was one character, Vera, that drove me crazy, but I think she was supposed to drive the reader crazy. The character developme I was contacted on behalf of the author to write an honest review of this book. Immediately the description made it sound like something I would definitely be interested in. It took a while for me to get through it, but that's simply because I am getting used to taking care of two kids. I think the story was pretty good. It was a little slow to get to the action and there was one character, Vera, that drove me crazy, but I think she was supposed to drive the reader crazy. The character development was pretty good. I felt like Sebastian, the vampire, evolved rather quickly and without a lot of explanation. Violet was wonderfully written though. So what's the story about? In this world vampires and witches are known to exist and even have their own special city called X. However, the two races are on the brink of war and no one really knows why. Violet is being shipped off to X with her aunt Vera for her own protection. The problem is that the war his X first and Violet ends up in the middle of it. She ends up being drug all over the place because her aunt must do everything in the most polite and socially proper manner. Violet is stuck following Vera's crazy rules of propriety, but it really was in her best interest. She ends up learning the hard way what happens when she doesn't listen to her aunt when she ends up engaged to smortal whom she really doesn't love. Unfortunately the engagement is a binding contract via magic. Violet is bound to do everything her fiance asks her to do which means her magic ends up being used for trivial things to satisfy her mother-in-law's whims. Everything is going according to the mortal's plans until Violet truly falls in love...with a vampire. life, and now she and Cyril are...engaged? would have been great, too. Gimme the romance! Gayla Twist and Ted Naifeh. Amazing Story! I couldn't put it down when reading it! Gayla Twist has a unique style of writing that captures your interest right away. Gayla also knows a thing or two about how to spin romance and suspense together, I was so intrigued by her characters and the storyline that I read it in one straight sitting. With the threat of a nasty war brewing between the world of Witches and Vampire on the horizon, Violet Popplewell flees to the safety of city-state of X with her annoying but well minded a Amazing Story! I couldn't put it down when reading it! Gayla Twist has a unique style of writing that captures your interest right away. Gayla also knows a thing or two about how to spin romance and suspense together, I was so intrigued by her characters and the storyline that I read it in one straight sitting. With the threat of a nasty war brewing between the world of Witches and Vampire on the horizon, Violet Popplewell flees to the safety of city-state of X with her annoying but well minded aunt Vera. Violet finds the city of X to be quite different then she expected. X is a place where magic is used openly and Witches and Vampires live together in harmony or at lest they are suppose to but with war brewing no one seems to be at ease even those within the city walls. Its in the City that Violet meets Sebastian a young Vampire seeking refuge in the city like so many others, drawn together beyond their control they seek to stop an age old war and the many forces working against them. Can a good Witch and a brooding Vampire find true love? Especially when the whole world is against them? I loved the characters in this! Vera was a hoot always with her nay saying and constant prejudice against Vampires. The Misses Fates were wonderful! I would love to read more about them I think their story could fit in a book of its own...LOL..Mr B was also a fav of mine he was always there with his wisdom, his humour or his help when needed. Gayla Twist brought these characters to life in such a way that you never want to let them go when the story is over and they leave a lasting impression after it is over. I want to start off by talking about the characters. This book is filled with interesting and different people. Violet is such a charming girl. She could take everything in such good stride. Sebastian is the mystery lover. We don't know a lot about the boy but he does his best at keeping Violet safe when the man she is engaged to cannot. We can't forget about Vera, Violet's great-aunt. She is....to give it to you straight, annoying. But it isn't in a bad way. I believe the authors wanted her to I want to start off by talking about the characters. This book is filled with interesting and different people. Violet is such a charming girl. She could take everything in such good stride. Sebastian is the mystery lover. We don't know a lot about the boy but he does his best at keeping Violet safe when the man she is engaged to cannot. We can't forget about Vera, Violet's great-aunt. She is....to give it to you straight, annoying. But it isn't in a bad way. I believe the authors wanted her to be this way. In no way does it take away from the story. 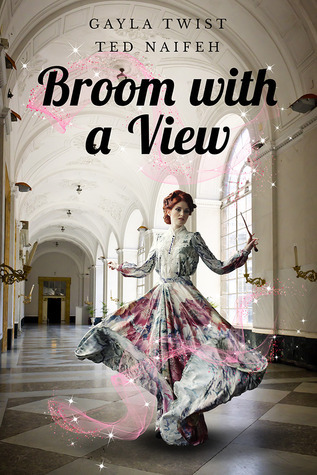 I found that Broom with a View was a quick and easy read. At first, it seemed a bit slow, but that changes. The biggest thing that kept me reading was how long Violet was going to put up with Mr. Wilberforce and his mother. I also didn't seen the nice twist coming at the end of book. Twist was able to add witches and other magical beings to her world of vampires. I also liked how she re-vamped the vampires so they are not like her other series of books, keeping the story fresh. Gayla Twist has written a lovely tale about the power of love. Violet and Sebastian have an entire deck of cards stacked against them. She is a witch and he is a vampire - their species have been at war for decades. When Violet visits X with her Aunt Vera, she meets Sebastian and his father at the pensione where they are all staying. When violence breaks out between the witches and vampires, it turns Violet's previously simple life upside down. Relations between witches, vampires, and mortals com Gayla Twist has written a lovely tale about the power of love. Violet and Sebastian have an entire deck of cards stacked against them. She is a witch and he is a vampire - their species have been at war for decades. When Violet visits X with her Aunt Vera, she meets Sebastian and his father at the pensione where they are all staying. When violence breaks out between the witches and vampires, it turns Violet's previously simple life upside down. Relations between witches, vampires, and mortals come to an exciting head that directly involves Violet. If you are like me and wanted something new from a vampire romance this is the book for you! I've read all of Gayla Twist's Vanderlind books and loved them, but this book was so different and enchanting. It reminded me of the silliness of a Cohen Bros movie! a cute little story, in an interesting magical world! I won this book and would like to thank the author. The only reason i didn't give this book 5 stars is because I like more action. The book is well written, the characters where well develop, and the book was easy to read. An interesting take on the supernatural community that is in most sci-fi and fantasy books. The characters are unique and story is interesting, but I feel like something is missing. A good, fun read all around. Fun, light read if you like the whole witches/vampires thing. For those of you who have read Room With A View (or even seen the movie) much of this will seem derivative. Still it's handled in an interesting, light way and worth spending a rainy afternoon on it. Super cute and well written. Cute story, although I like the Vanderlind vampire books a bit better. I keep adding to my never ending free kindle books that I will probably never get to, but at least I always have a backup to read on the road. The writing was good, but not quite my type of story. Please, save you this reading. It is by far one of the worst, not to say the worst, novel I have read in a very long time! I really liked this book. Reminded me a bit of Anne of Avonlea but with a fantasy twist. Definitely keeping this one on my bookshelf!